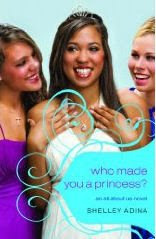 Did you read my post about Who Made You A Princess earlier in the week? It was a great read that any tween or teen girl would enjoy. Three of my readers will win a copy of this great book. If you already do any or all of these things, simply leave me the appropriate comments. Contest runs from today until 8:00CST on July 22. Winner will be announced and contacted via email on July 23rd. Be sure I have a way to contact you! Good luck! Wasn't sure if I was to leave an initial comment regarding the book. I don't want to disqualify myself, so I combined the first entry with my comment. Comment: My daughter is an avid reader. I'm sure this would be a great addition to her collection. This looks like a great book for a tween!